It turns out the term 'pudding' has different meanings all over the world. In North America it's usually a creamy dessert treat, in the UK it's a soggy bread mess, and in Japan it's a pre-scrambled boiled egg that's drizzled with caramel sauce. 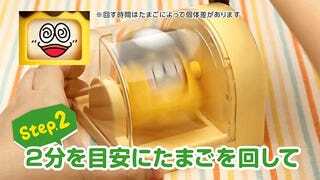 And now the Japanese version is a lot easier to make with this whimsical looking spinning contraption from Takara Tomy.